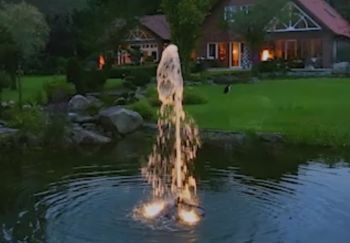 Exclusive to Water Garden Ltd, the all-new Dancing Fountain Pump offers a unique and captivating dynamic fountain display in any garden pond or water feature. 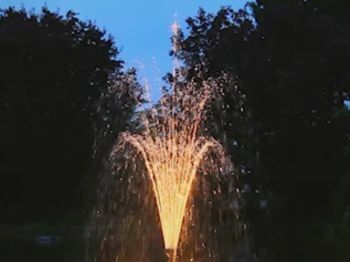 The fully submersible pump features an innovative built-in pre-programmed sequence which causes the water display to rise and fall in a random pattern and more than one pump can be used to create multiple dancing displays. The dancing pump is supplied with the Vulkan 37-2.5K Multi-Jet Fountain Nozzle, which will reach a maximum display height of 4m. 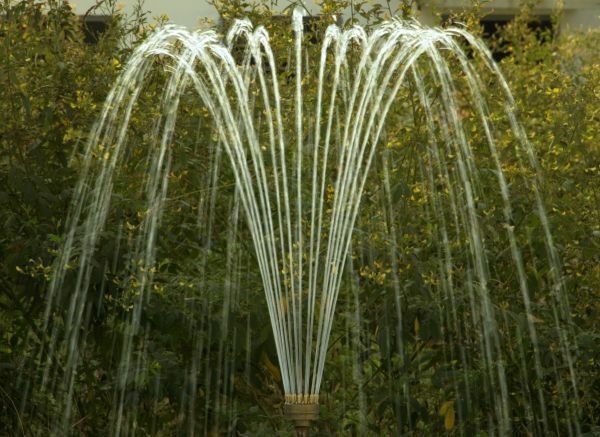 This nozzle creates an ornate tiered design consisting of 3 levels of crown-like water displays. 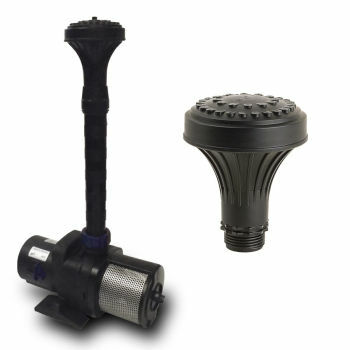 Water Garden can offer a variety of optional fountain nozzle attachments which can simply be screwed to the top of the pump, creating a plethora of exciting water patterns. 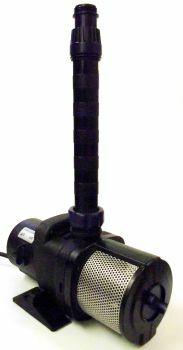 The pump is supplied with 20 metres of 230v cable and also includes a height adjustable telescopic riser, allowing the pump to be submersed in water ranging from 30cm to 65cm depth. The Dancing Fountain Pump can also be mounted in deeper water, simply by using an additional Telescopic Riser or by raising the pump off the base of the pond or reservoir. We highly recommend the use of optional Underwater LED Spotlights to further enhance the dynamic water display during the evening. 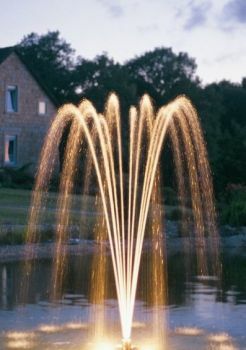 The Dancing Fountain Pump is very simple to install and only requires connection to a 230 Volt, single phase electrical supply (20 metres of cable supplied, pre-wired to pump). The dancing sequence is pre-programmed and installed into the pump housing itself, so there is no need for complex DMX programming and the fountain can be installed as easily as a standard garden pond pump. The dancing program will slowly cycle through a 5 minute series of effects, which is then automatically repeated. 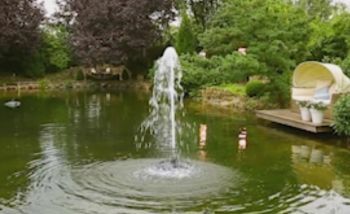 The pump is also fitted with a slider switch, allowing you to operate the pump in Dancing Mode or Static Mode (full fountain at all times). 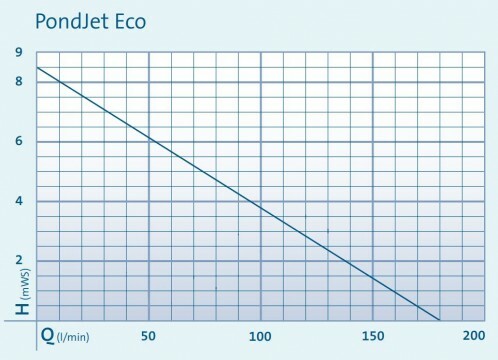 The special Eco motor is incredibly energy efficient, consuming only 190 watts. This power consumption is further reduced when in Dynamic Mode. 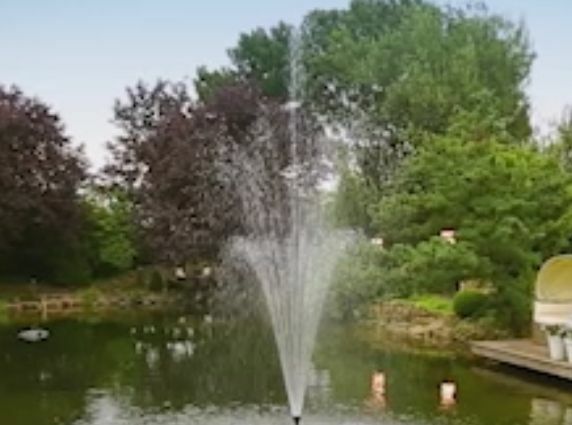 The maximum display height can be easily adjusted and set using the built-in mechanical flow regulator (fitted to the inlet of the fountain pump), making this ideal for virtually any size or shape of pond. 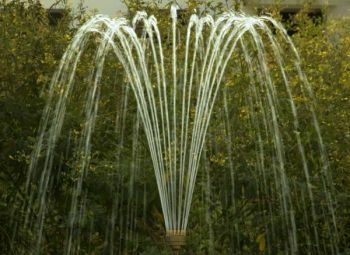 The pump can also be mounted in an Underground Water Reservoir, allowing a pondless fountain to be created in a garden or landscaped area, without the need for open water. The Dancing Fountain Pump should ideally be used in clear, debris free water to reduce detritus from blocking the smaller holes in the Multi-Jet Nozzle options. If silt or debris is present, we suggest raising the pump off the base of the pond to pull cleaner water nearer the surface, or install a suitable Pond Filter System.